It’s not often that I’m alone and have time to spare – a great luxury. I was in London and thought I would see an exhibition. None of the ones I hadn’t seen attracted me, so I decided to wander through the National Portrait Gallery. Some time ago I asked my friend Paolo whether Italy had such a gallery. ‘No,’ he said, ‘unless you count the corridor from the Uffizi Gallery which crosses the Arno to reach the Pitti Palace.’ It was built as an escape route for any of the Medici or their entourage, who might find themselves in danger in the Uffizi or administrative offices as this building originally was, right next to the forbidding, fortified Palazzo della Signoria in the heart of Florence and the place where riots broke out. For some centuries now self-portraits of artists given to the Medici dukes, have been hung there, and interesting they are. Being by artists, they all have some quality, and that satisfied Paolo. ‘It doesn’t exist. If it did, most would be of poor quality,’ was his answer. Do they only exist in England, Scotland, the USA and Australia? Canada too, I expect. I don’t know about Scandinavian countries. Then I thought back to a day in Florence when I had gone into a bookshop and asked for the biography section. It didn’t exist. Works on Garibaldi or Mussolini were in the history section. Will that change with Berlusconi, I thought mischievously. Probably his autobiography will be ghosted. Back to the Elizabethan era and John Donne. He died aged 59 after having written a great deal of poetry. I’m dipping into the love ones and others addressed to friends, such as Sir Henry Wotton on his departure as Elizabeth’s ambassador to Venice. He fought under the command of Sir Walter Raleigh, a fellow poet 20 years older, at Cadiz. Did he frequent Raleigh’s circle of scientist, poets and mathematicians at Durham House? He was probably too young. Did he meet playwrights at the Mermaid Tavern? Was he acquainted with know his older contemporaries, Shakespeare, 8 years older as was Marlowe, and Ben Jonson, his age, and Inigo Jones, one year younger than Donne, and John Milton? Unlikely, as he was 36 when Milton was born. I read somewhere that the population of England in Elizabeth’s reign was about three million, so perhaps it was easier to bump into people while crossing a square. A poet friend of mine said that he thought, on a far vaster scale of course, the amount of writing that is posted on the internet is like the Elizabethan era when poets abounded, though then, as now, only some are great beyond their generation. 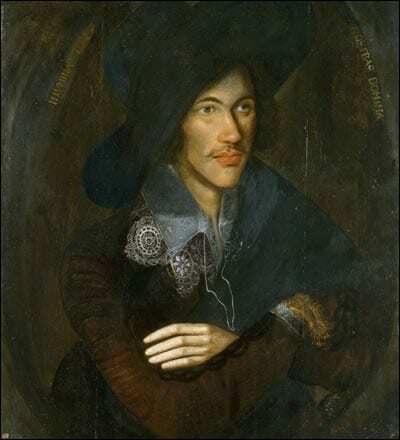 So I was grabbed by the quality of this anonymous portrait of John Donne as a young man in London’s National Portrait Gallery, shining among ones of lesser quality but a fascinating gallery of his contemporaries.